The Earth's Endangered Creatures website lists a whopping 2,588 endangered animals in Ecuador. These include reptiles, amphibians, mammals, fish, corals, sea anemones, snails and crustaceans. This country, with Darwin's Galapagos Islands to the east, is home to unique and historically significant species of all shapes and sizes. Nine reptile and 192 amphibian species are endangered in Ecuador, according to the Earth's Endangered Creatures site. Reptiles include crocodiles, iguanas, caimans, tortoises and turtles, including the tartaruga and tracaja. Endangered amphibians include more than a hundred species of frogs, toads and salamanders. Deforestation, water pollution and erosion destroy these animals' habitats, and often destroy the animals themselves. Among the endangered list is the Amazon glass frog. Fewer than 5,000 of these frogs with transparent skin remain. Dozens of mammal species are endangered in Ecuador. The Andean spectacled bear, for example, is the only bear in South America, and fewer than 3,000 remain, according to National Geographic. 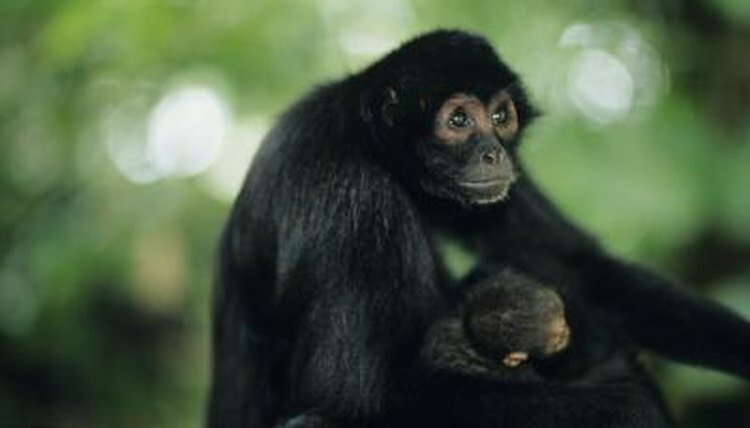 Spider monkeys, night monkeys, marmosets, tamarins, woolly monkeys and capuchins are endangered. Several kinds of bats, rats, weasels, otters, opossums, mice, hogs, dogs and other creatures face threats. Endangered cats include cougars, jaguars, ocelots, little spotted and pampas cats. The water is no protection as seals, sea lions and dolphins hit the endangered list as well. Ecuador's coastal location means several species of fish are endangered, from the great white shark to the tiny Pacific seahorse, captured for use in traditional medicine and curio collection. Catfish, grouper, fiddlefish, sawfish, tuna and devil fish face threats, as do several rays including bentfin and Japanese devils, black-blotched, bullseye electric, golden cownose, spotted eagle and longnose eagle rays. Endangered sharks include not only the great white, but hammerhead, liver-oil, oceanic whitetip, basking, sharpfin, speckled smoothhound, whale, crown and Galapagos sharks. Animals in and around Ecuador are endangered for many reasons, including coastal and land development, overfishing, water pollution, hunting, habitat loss, pet trades and animals being killed as nuisances. Ecuador has suffered massive deforestation, with hundreds of thousands of acres of forest, mangrove area and other natural areas razed. This leads to significant habitat loss and food loss for animals. Deforestation occurs to make room for crops, farm animals and other agricultural endeavors, as well as oil development.